Description: God's system of answered Prayer! God's Word is alive and powerful. It is living substance. It is law in the world of the spirit. Prayer is governed by spiritual laws and is designed to work for you. It is more powerful than the laws of nature that rule the universe today. Many times our prayers have bound God. 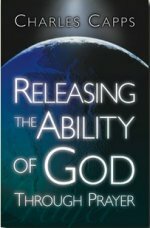 When you learn to pray faith-filled words, you release God's ability and bring Him on the scene in your behalf. Under the New Covenant contract sealed by the Lord Jesus Christ in His own blood you have a legal right to enter the throne room of God. You can stand in God's presence without fear and be completely free from a sense of guilt. You can ask God to intervene supernaturally in your behalf. God's Word never changes --It changes things! God gave you His Word to put you over. He designed it to work in every area of life. His Word works, and it isn't limited by time or distance. Effective prayer using His Word will destroy the kingdom of darkness and release the ability of God in the earth.